113 Flounced Rustic, 22 Setaceous Hebrew Character, 25 Rosy Minor, 24 Vine's Rustic, 18 Cloaked Minor, 11 Small Broad-bordered Yellow Underwing, 11 Rustic/Uncertain, 8 Common/Lesser Common Rustic, 7 Turnip Moth, 6 Straw Underwing, 6 Smoky Wainscot, 5 White Point, 5 Common Wainscot, 5 Orange Swift, 4 Yellow Shell, 4 Large Yellow Underwing, 4 Bright-line Brown Eye, 4 Shuttle-shaped Dart, 3 Flame Shoulder, 3 Chinese Character, 3 Brimstone, 2 Square Spot Rustic, 2 Dark Sword Grass, 2 Dark Arches, 2 Mouse, 2 Feathered Gothic, 1 Willow Beauty, 1 Scalloped Oak, 1 Poplar Hawk Moth, 1 Southern Wainscot, 1 Six-striped Rustic, 1 Common Wave, 1 Hedge Rustic, 1 Light Emerald, 1 Clouded Border, 1 Satin Wave. Total : 311 moths of 36 species. 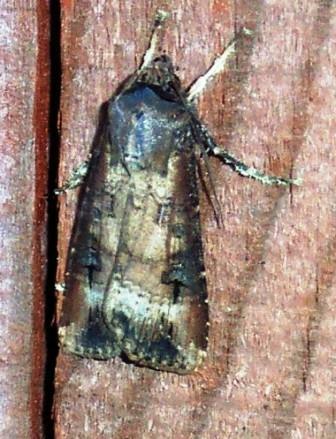 Dark Sword Grass - a regular migrant. Norsey Wood, Billericay : August 28th : Helped Les Steward and the Park Ranger, Chris Huggins, run a Bat & Moth Night at the visitor centre. Around 30 people attened the Bat Walk, of which a dozen or so remained for the moth trapping. In contrast to the 21st the night was cool and clear and catching was slow during the two and a half hours the traps were set. However, we caught a good selection of colourful species, Lesser Swallow Prominent, Green Carpet, Orange Swift, Yellow Shell, Brimstone, Light Emerald, Flame Shoulder and Marbled Beauty among them, which helped maintain interest. A less expected capture was a male Long-winged Conehead, a once rare cricket that is now widespread in Essex. Also of interest was a report from one of the people attending of 50 caterpillars of the Toadflax Brocade feeding on Purple Toadflax in a garden at Standford - le - Hope. There was a small influx of this rare moth into the County this spring but this is the first instance I have had of proof of breeding resulting from that. Previously, according to Brian Goodey (2004) suspected breeding had been confined to the extreme northeast of the County. It is possible, though, that this situation has changed in the interim.